As a proponent of XML for legislation, I’m often asked why an XML approach is better than a more traditional approach using a word processor. The answer is simple – it’s all about connected information. The digital end point in a legislative system can no longer be publication of PDFs. PDFs are nothing but a kludgy way to digitize paper — a way to preserve the old traditions and avoid the future. Try reading a PDF on a cell phone and you see the problem. Try clicking on a citation in a PDF and you see the problem. Try and scrape the information out of a PDF to make it computer readable and you see the problem. The only useful function that PDFs serve is as a bridge to the past. The future is all about connected information — breaking the physical bounds of what we think of as a document and allowing the nuggets of information found within them to be connected, interrelated, and acted upon. This is the real reason why the future lies with XML and its related technologies. In my blog last week I provided a brief glimpse into how our future amending tools will work. I explored how legislation could be managed similar to how software is managed with GitHub. This is an example of how useful connected information becomes. Rather than producing bills and amendments as paper documents, the information is stored in a way that it can be efficiently and accurately automated — and made available to the public in a computer readable way. At Xcential, we’re building our new web-based authoring system — LegisPro. If you take a close look at it, you’ll see that it has two main components. Of course, there is a robust XML editor. However, at the system’s very heart is a linking system — something we call a resolver. It’s this resolver where the true power lies. It’s an HTTP-based system for managing all the linkages that exist in the system. It connects XML repositories, external data sources, and even SQL databases together to form a seamless universe of connected information. We’re working hard to transform how legislation, and indeed, all government information is viewed. It’s not just about connecting laws and legislation together through simple web links. We talking about providing rich connections between all government information — tying financial data to laws and legislation, connecting regulatory information together, associating people, places, and things to government data, and on and on. We have barely started to scratch the surface, but it’s clear that the future lies with connected information. While we today position LegisPro as a bill authoring system — it’s much more than that. It’s some of the fundamental underpinnings necessary for a system to transform government documents of today into the connected information of tomorrow. Can GitHub be used to manage legislation? Every so often, someone suggests that GitHub would be a great way to manage legislation. Usually, we roll our eyes at the naïve suggestion and that is that. However, there are a good many similarities that do deserve consideration. What if the amending process was supported by a tool that, while maybe not GitHub, worked on the same principles? My company, Xcential, built the amending solution for the California Legislature, using a process we like to call Amendments in Context. With this process, a proposed revision of a bill is drafted and then the amendments necessary to produce that revision are extracted as an amendment document. That amendment document, which really becomes an enumeration of proposed changes in a report, is then submitted to the committee for approval. If approved, the revised document that was drafted earlier then becomes the next official version of the bill. This process differs from the traditional process in which an amendment document is drafted, itemizing changes to be made. When the committee approves the amendments, there is a mad rush, usually overnight, to implement (or execute) those amendments to the last version in order to produce the next version. Our Amendments in Context automated approach is more accurate and largely eliminates the overnight bottleneck of having to execute approved amendments before the start of business the following day. Since implementing this system for California, we’ve been involved in a number of other jurisdictions and efforts that deal with the amending process. This has given us quite a good perspective on the various ways in which bill amendments get handled. As software developers ourselves, we’ve often been struck by how similar the bill amendment process is to the software development process — the very thing that invariably leads to the suggestion that GitHub could be a great repository for legislation. With this all in mind, let’s compare and contrast the bill amending process with the software development process using GitHub. 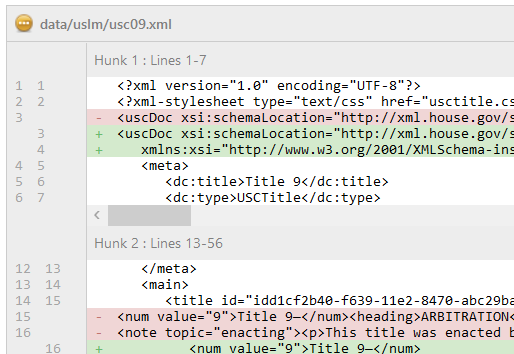 Make the proposed changes using redlining, showing the changes as insertions and deletions. Carefully craft the changes to obey the drafting rules and any political sensitivities regarding how the changes are shown. Make the proposed changes to the software — testing and debugging as needed. The amendment generator examines the redlining (insertions and deletions), carefully grouping changes together to produce a minimized set of amendments. 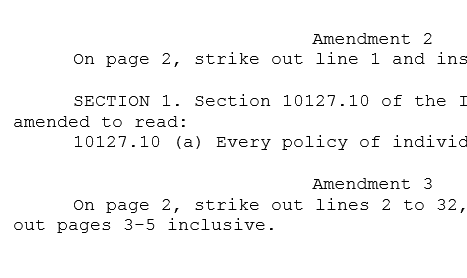 These amendments are expressed in the familiar, at least in the U.S., “on page X, line Y, strike ‘this’ and replace with ‘that'” or something along those lines. (For jurisdictions that don’t use an amendment generator, a manually written amendment document, enumerating the amendments, is the starting point) A differencing engine compares the source code with the prior version, carefully grouping changes together to produce a minimized set of hunks. If you use a tool such as SourceTree by Atlassian, these hunks are shown as source code with lines to be removed and lines to be inserted. The amendment document goes to committee where it is proposed and then either adopted or rejected. The procedures here may differ, depending on the jurisdiction. In California, multiple competing amendment documents (known as instruction amendments) may be proposed at any one time, but only one can be adopted and it is adopted in whole. Other jurisdictions allow multiple amendment documents to be adopted and individual amendments with any amendment document to be adopted or rejected. The review board considers the proposed enhancement and decides whether or not to incorporate them into the next release. They may choose to adopt the entire enhancement or they may choose to adopt only certain aspects of it. In California, because only single whole amendments can be adopted, executing an adopted amendment is quite easy — the redlined version of the bill simply becomes the next version. However, in most jurisdictions, this isn’t so easy. Instead, each amendment must be applied to a new copy of the bill, destined to become the next version. Conflicts that arise must be resolved following a prescribed set of procedures. Incorporating an enhancement into the mainline involves a merge of the enhancement branch into the mainline. If an enhancement is not adopted in whole, then approved changes may be cherry picked. When conflicts between different sets of approved enhancements occur, GitHub requires manual intervention to resolve the issues. This process is generally a lot less formal than resolving conflicts in legislation. So, as you can see, there are a lot of similarities between amending a bill and implementing a software enhancement. The basic process is essentially identical. However, the differences lie in the details. Git is designed specifically for the software development process. The legislative process has quite a different set of requirements and traditions which must be met. It simply isn’t possible to bend and distort the legislative process to fit the model prescribed by Git. However, that doesn’t mean that something like GitHub is out of the question. What if there was a GitHub for Legislation — a tool with an associated repository, modeled after Git and GitHub, specifically designed for managing legislation? This example shows the power of adopting XML for drafting legislation. With properly designed XML, legislation becomes a vast store of machine-readable information that can meet the 21st century challenges of accuracy, efficiency, and transparency. We’re not just printing paper anymore — we’re managing digital information. Data Transparency Breakfast, LEX US Summer School 2015, First International Akoma Ntoso Conference, and LegisPro Edit reveal. Last week was a very good week for my company, Xcential. We started the week hosting a breakfast put on by the Data Transparency Coalition at the Booz Allen Hamilton facility in Washington D.C.. The topic was Transforming Law and Regulation. Unfortunately, an issue at home kept me away but I was able to make a brief pre-recorded presentation and my moderating role was played by Mark Stodder, our company President. Thank you, Mark! Next up was the first U.S. edition of the LEX Summer School from Italy. I have attended this summer school every year since 2010 in Italy and it’s great to see the same opportunity for an open dialog amongst the legal informatics community finally come to the U.S. Monica Palmirani (@MonicaPalmirani), Fabio Vitali, and Luca Cervone (@lucacervone) put on the event from the University of Bologna. The teachers also included Jim Mangiafico (@mangiafico) (the LoC data challenge winner), Veronique Parisse (@VeroParisse) from the European Union, Andrew Weber (@atweber) from the Library of Congress, Kirsten Gullickson (@GullicksonK) from the Office of the Clerk at the U.S. House of Representatives, and myself from Xcential. I flew in for an abbreviated visit covering the last two days of the Summer School where I covered how the U.S. Code is modeled in Akoma Ntoso and gave the students an opportunity to try out our new bill drafting editor — LegisProedit. After the Summer School concluded, it was followed by the first International Akoma Ntoso Conference on Saturday, where I spoke about the architecture of our new editor as well as how the USLM schema is a derivative of the Akoma Ntoso schema. We had good turnout, from around the world, and a number of interesting speakers. This week is NCSL in Seattle where we will be discussing our new editor with potential customers and partners. Mark Stodder from Xcential will be in attendance. In a month, I’ll be in Ravenna once more for the European LEX Summer School — where I’ll be able to show even more progress towards the goal of a full product line of Akoma Ntoso tools. It’s interesting times for me. The editor is coming along nicely and we’re beginning to firm up our QuickStarter beta plans. I’ve already received a number of requests and will be getting in touch with everyone as soon as we’re ready to roll out the program. If you would like to participate as a beta tester — or if you would just like more information, please contact us at info@xcential.com. I’m really excited about how far we’ve come. Akoma Ntoso is on the verge of being certified as an official OASIS standard, our Akoma Ntoso products are coming into place, and interest around the world is growing. I can’t wait to see where we will be this time next year. I’ve been working hard for a long time — building an all new web-based editor for Akoma Ntoso. We will be showing it for the first time at the upcoming Akoma Ntoso LEX Summer School in Washington D.C. Unlike our earlier AKN/Editor, this editor is a pure XML editor designed from the ground up using the XML capabilities that modern browsers possess. This editor is much more robust, more precise, and is very scalable. 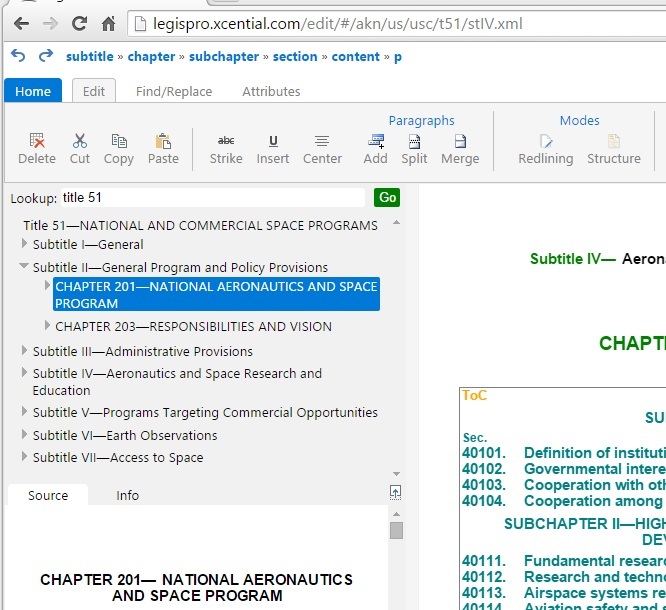 Browse document sources with drag-and-drop. We’ll reveal a lot more at the LEX Summer School later this month! If you’re interested in our QuickStart beta program, drop me a note at grant.vergottini@xcential.com. And now for something completely different… Chinese! Last week we saw how Akoma Ntoso can be applied to a very large consolidated Code – the United States Code. This week we take the challenge in a different direction – applying Akoma Ntoso to a bilingual implementation involving a totally different writing system. Our test document this week is the Hong Kong Basic Law. This document serves as the constitutional document of the Hong Kong Special Administrative Region of the People’s Republic of China. It was adopted on the 4 April 1990 and went into effect on July 1, 1997 when the United Kingdom handed over the region to the People’s Republic of China. The Hong Kong Basic Law is available in English, Traditional Chinese, and Simplified Chinese. For our exercise, we are demonstrating the document in English and in Traditional Chinese. (Thank you to Patrick for doing the conversion for me.) Fortunately, using modern technologies, supporting Chinese characters alongside Latin characters is quite straightforward. Unicode provides a Hong Kong supplementary character set to handle characters unique to Hong Kong. The biggest challenge is ensuring that all the unicode declarations throughout the various XML and HTML files that the information must flow through are set correctly. With the number of accents we find in names in California as well as the rigorous nature of California’s publishing rules, getting Unicode right is something we have grown accustomed to. The only issue we encountered was Internet Explorer’s support for CSS3. 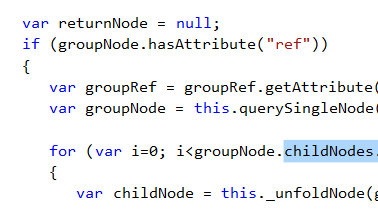 Apparently, IE still does not recognize “list-style-type” with a value of “cjk-ideographic”. So instead of getting Traditional Chinese numerals, we get Arabic numerals. The other browsers handled this much better. So what other considerations were there? A big consideration was the referencing mechanism. To me, modeling how you refer to something in an information model can be more important than the information model itself. The referencing mechanism defines how the information is organized and allows you to address a specific piece of information in a very precise and accurate way. Done right, any piece of information can be accessed very quickly and easily. Done wrong and you get chaos. Our referencing mechanism relies on the Functional Requirements for Bibliographical Records (FRBR). This mechanism is used by both SLIM and Akomantoso. Another interesting FRBR proposal for legislation can be found here. FRBR defines an information model based on a hierarchical scheme of Work-Expression-Manifestion-Item. Think of the work as the overall document being addressed, the expression being the version desired, the manifestation the format you want to information presented in, and finally the item as a means for addressing a specific instance of the information. Typically we’re only concerend with Work-Expression-Manifestation. The expressions are called out as “doc;en-uk” for the English version and “doc;zh-yue” for the Chinese version. Relatively straightforward. The manifestations are not shown and the result is the default manifestation of HTML. Check the samples out and let me know what you think.